Baking up love one recipe at a time. Valentine’s Day was approaching this past February, and I wanted to bring in a little treat for my fellow co-workers. I enjoy doing stuff like that. However, there’s a healthy eating movement going through my office (Hooray! ), so I didn’t want to choose anything too buttery or sugary, lest nobody ate it, or it made someone feel guilty about eating it. To add to the challenge of bringing a healthy treat, one co-worker in particular had just started a 30 day Paleo Challenge. Amongst other things, there’s no sugar whatsoever, no grains, no oils/butter except extra virgin olive oil or coconut oil. That meant no chocolate. No chocolate on Valentine’s Day?!? The horror!! Anyway, everybody deserves a little sweet treat on Valentine’s Day, in my book, so I accepted the challenge, and Paleo Date Nut Bars were born. 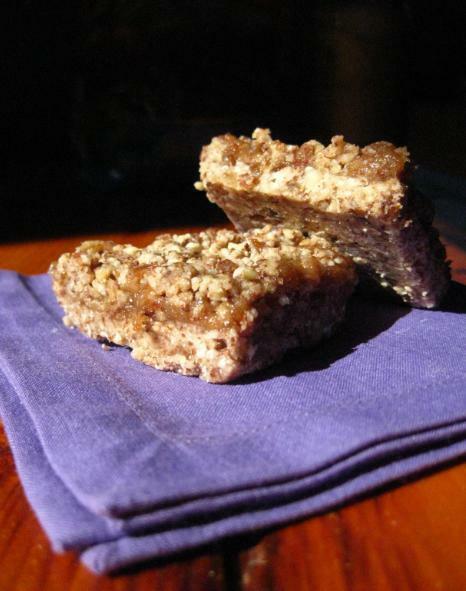 These are suitable for anyone following a vegan, paleo, gluten-free, and/or sugar -free diet. The only sugar is that naturally occurring in dates. I hope you enjoy them! Grease an 8″x8″ pan well with coconut oil. 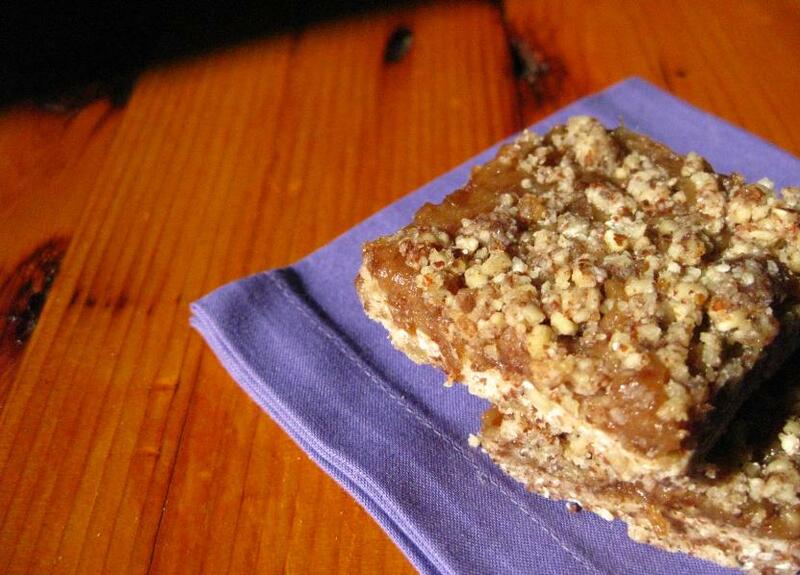 In a food processor, process the almonds, salt, and almond meal until a fine crumble forms. Add the dates and process until crumbly again. Melt the coconut oil and add to the mixture and process until sticky. You can add a little more oil if the mixture is too dry. Remove from processor, setting aside 3/4 cup of the mixture for later, and press the rest of the mixture firmly and evenly into the pan. Process the dates for the filling with the water until a smooth paste forms. Stop and scrape down the sides of the bowl often. Mixture should be quite thick, but add a little more water if needed. Scoop out the date mixture onto the crust and gently spread with the back of a wet spatula until even. Sprinkle on the 3/4 cup of mixture you set aside and gently press down with fingers. Refrigerate for overnight or freeze for an hour until set. Cut into squares and serve. Store in the fridge or freezer.